Create a "Where I'm From" memory poem to share with your family, friends, community and the state. Kentucky’s “Where I’m From”: A Poetry of Place explores the Commonwealth through memory poems. Don’t panic — a “Where I’m From” memory poem isn’t as difficult as you may think. It follows the structure and style of Kentucky Poet Laureate George Ella Lyon’s original “Where I’m From” poem and is simply a list of what’s important to you. The popular poem is used all over the world as a template for others to write their own memories. Schools, businesses and gatherings of all kinds have found that creating and sharing “Where I’m From” poems is a great way for people to become acquainted. All poems must be written following the structure and style of the original. All poems must include the writers’ names, communities or schools, and counties. Poems must be submitted in a Microsoft Word or compatible document. County contacts must submit multiple poems in a single document. This is NOT a competition; there will be no winners or losers. 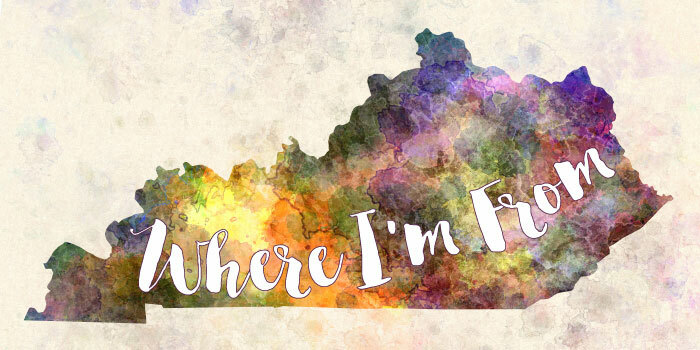 Contacts in each county will collect “Where I’m From” poems and submit them to the Kentucky Arts Council. Check the county contacts list for your local contact. “Where I’m From” poems may be written or performed. Audio and video, (including live action and animation,) poems must be uploaded to YouTube or SoundCloud. Poems will be included on the website once a month. The deadline to submit is Dec. 1, 2016. The arts council reserves the right to limit its webpage publication of poems due to space restrictions or inappropriate content. No contact designated in your county? Volunteer! Contacts help spread the word about the project, coordinate local “Where I’m From” projects and serve as a collection point where people can submit their poems. Public libraries; public, private and home schools; colleges and universities; county extension offices; community centers; businesses; assisted living centers and nursing homes; and other organizations and agencies are excellent county contacts. Collaboration between several contacts within a single county is strongly encouraged. We’ve included some ideas for activities below. Interested in being a county contact? Email tamara.coffey@ky.gov. Read or listen to George Ella Lyon read the poem. You’ll notice that it is basically a list of experiences that shaped her into the person she is today. Brainstorm a list of people, places, foods, sports, music, family sayings, etc., that have made you You. Then play with the arrangement of these images till you find one you like. Poems are like jigsaw puzzles made of sound, so reading out loud will help you hear where the pieces fit. Think about your favorite writer or literary character and do the kind of brainstorming for him or her described above. This may require some research. Then step into that person’s shoes and create a poem written as if you were him or her. Create a poem about a member of your family or community. Write a poem as if you were a tree or an animal. Write a poem from the perspective of your community or favorite place. Create a visual or audio version of your poem (see examples at GeorgeEllaLyon.com). Host a reading and include audio, video and musical interpretations of the poems. Produce a “Where I’m From” poetry slam and encourage students and young adults to participate. Develop a webpage that includes community poems in written, audio and video formats. Make a chapbook of written poems to distribute at the county fair, library, schools, extension office, etc. Exchange poetry readings from a high school classroom to a middle school classroom and vice versa. Bring together senior citizens from a senior center or nursing home and students from middle and high schools to share and discuss their poems with each other. Arrange to have the local newspaper, radio station or cable access channel include poems from the community. Invite the community to share and write new poems at a potluck dinner.